"Winds from Dennis forced water against the southwestern Florida coast, creating a bulge of high sea level from Naples to around Tampa," Morey explained. When Hurricane Dennis passed North Florida on July 10, 2005, it caused a 10-foot storm surge in some areas along Apalachee Bayabout 3 to 4 feet more than forecastthat couldn't be explained simply by the local winds that conventionally drive storm surge. Now, scientists at Florida State University and the National Oceanic and Atmospheric Administration have found that the surge in Apalachee Bay was amplified by a "trapped wave" that originated off the southwest Florida coast. The discovery of this previously undocumented storm surge phenomenon has changed how NOAA's National Hurricane Center prepares storm surge models for the Gulf of Mexico. New modeling procedures will help improve the accuracy of storm surge forecasts for the entire Gulf Coast from Florida to Texas. Scientists Steven Morey, Mark Bourassa, Dmitry Dukhovskoy and James O'Brien of FSU's Center for Ocean Atmospheric Prediction Studies and Stephen Baig of NOAA's Tropical Prediction Center of the National Hurricane Center drew their conclusions after conducting numerical experiments with storm surge models. Their research was published in the Oct. 4 issue of the journal Geophysical Research Letters. Hurricane Dennis formed from a tropical depression that originated near the southern Windward Islands on July 4, 2005. It strengthened as it traveled northwest through the Caribbean Sea until it made landfall in Cuba as a Category 4 hurricane. It then traveled west of the Florida Shelf, and the storm's maximum sustained winds weakened to 121 mph before it made landfall on the western Florida Panhandle. "Winds from Dennis forced water against the southwestern Florida coast, creating a bulge of high sea level from Naples to around Tampa," Morey explained. "Oceanographers know that this 'bulge' will form a long wave that, in the Northern Hemisphere, will travel as a wave with the coast to the right. Because Dennis traveled nearly parallel to the Florida Peninsula coast at the same speed as the wave, winds from Dennis amplified the wave as it traveled to Apalachee Bay." The trapped wave then piled up on the shore along Apalachee Bay on top of the surge generated by the winds over the bay, according to O'Brien. 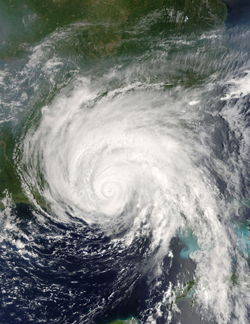 "To address these findings, we will use as necessary a larger geographical grid in our operational storm surge model in the Gulf of Mexico," said Baig, oceanographer and storm surge leader at NOAA's National Hurricane Center. "This will provide a more comprehensive view of a storm's potential impact in the Gulf by better accounting for the rare trapped wave effect." This type of remotely trapped wave could play a role in future storms that follow a path similar to Hurricane Dennis or travel westward south of the Louisiana coastline toward Texas, the scientists said. Funding from a NOAA Applied Research Center grant supported the research. Wind fields for the study were developed under funding by NASA and the National Science Foundation.